The Dune is a conceptual master plan for the City of West Sacramento that aims to activate the riverfront through historic land typologies. Sacramento’s river network is the city’s largest asset, yet there is little to no connection between Sacramento and its rivers and few areas to view or enjoy them. 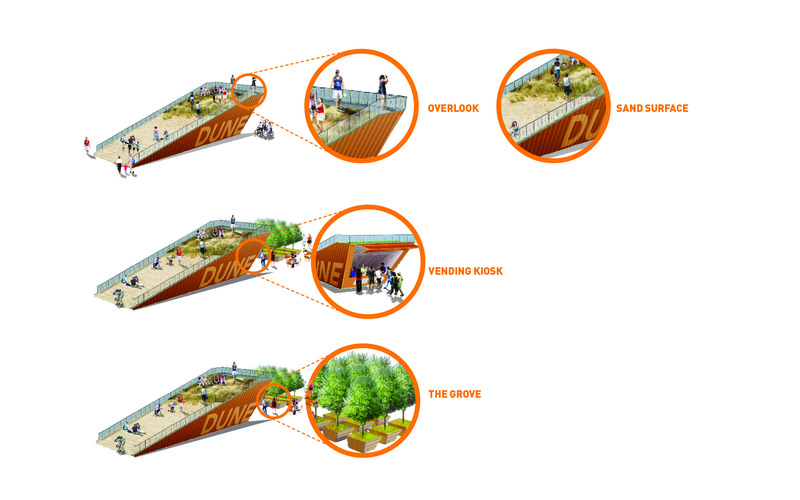 In response, The DUNE is an urban park along the Sacramento riverfront that serves to reconnect the City with the River. Taking cues from the historical Sacramento-San Joaquin delta ecology, the Dune proposes a riverfront experience that embodies the forms of the historic sand dunes and mounds (pre-1850s), paired with active programming to activate the Sacramento riverfront. The Dune is a microcosm. It symbolizes the most critical assets of the City while cultivating a new, contemporary identity for the city of Sacramento – strengthening public life, culture and development potential along the Sacramento River. While landscape may be often seen as a second-hand investment, the Sacramento riverfront is in a unique position to re-conceive itself as a cultural landmark. The Dune concept was developed for the Pitch for Change competition hosted by the Sacramento Chamber of Commerce – Metro EDGE organization. The Pitch for Change competition called for ideas about how to improve the Sacramento region (from local community members). The Dune concept was voted winner at the conference as the idea the community wanted to see implemented.